There are about approximately 170 kilometers between Hanoi and Halong. It is not so far distance, which makes this UNESCO World Heritage Site becomes easily accessible. 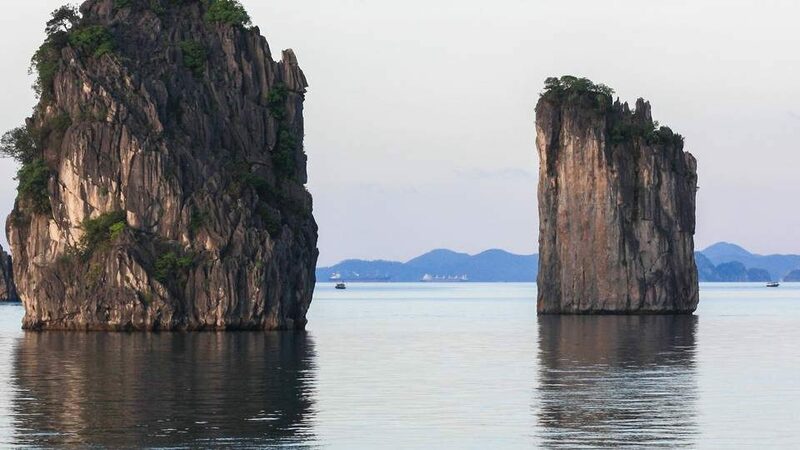 There are many options for you to get to Ha Long Bay depending on your budget, travel plan and personal purpose. 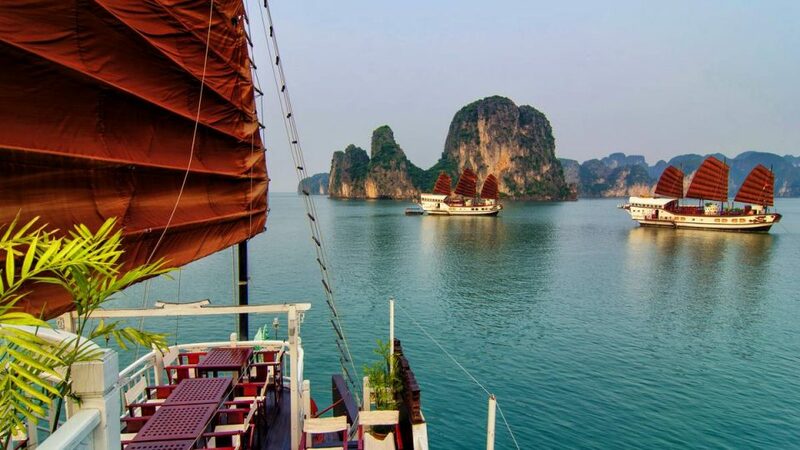 In this article, we will show you some means of transportation between Hanoi and Halong Bay. There are many kinds of transportation from Hanoi to Halong but shuttle bus/car is the most popular option. You can choose to hire a private car transfer or use shuttle bus service which is normally included in Halong Bay tour package. This type of transfer is available for departing from Hanoi center (or Hanoi Old Quarter area) only. The shuttle bus can be understood as “tourist bus”, leaving Hanoi around 07:00 – 08:00 am and return at 5:00 – 5:30 pm every day. If you are staying at a hotel in Hanoi Old Quarter, the shuttle bus will come to your hotel to pick you up. Otherwise, you have to take a taxi to the meeting point (normally is in front of Opera House). Local buses: Travelers can get a bus from Gia Lam or My Dinh bus station in Hanoi to Bai Chay bus station in Halong city. It currently costs about 7 – 10 $/person/way, it is cheap but more crowded and inconvenient as no one speaks English. Payment by VND (Vietnam dong) is accepted. Luxury van service is provided by Indochina Junk. We are said to be the first company offer the “Luxury Van Service” to give the customers more luxurious and comfortable transfer between Hanoi & Halong. The transportation is well included in a tour with Indochina Junk (no need to pay extra any fees) and has an affordable price to pay – a not really overpriced in comparison with Shuttle bus. It’s a brand new van which is renovated from original Ford 16 seats van. Now each van has only 7 huge leather seats and is featured with luxury interior design. Luxury vans provide huge and soft seats with seat belts. This kind of van has a lot of modern features. Departs from Yen Vien train station in the early morning and arrives Halong at 12:00 am. As reviewed, this train schedule is not convenient and takes longer time than shuttle bus. Moreover, when you reach Halong train station, you need to hire a taxi to go to the harbor, and on the train there are almost local people, most of them can’t talk and understand foreign language. If you dont mind the cost, this is the fastest and best way to transfer between Hanoi and Halong bay. The helicopter is available and supplied by Vietnam Northern Service Flight Company. This service is only available for charter and is at a higher budget range. They have MIA-17 (24 seat) and MIA -8 (12 seat), produced by Russia. The seaplane takes off from Noi Bai international airport and lands off at Tuan Chau Marina with only 45 minutes. 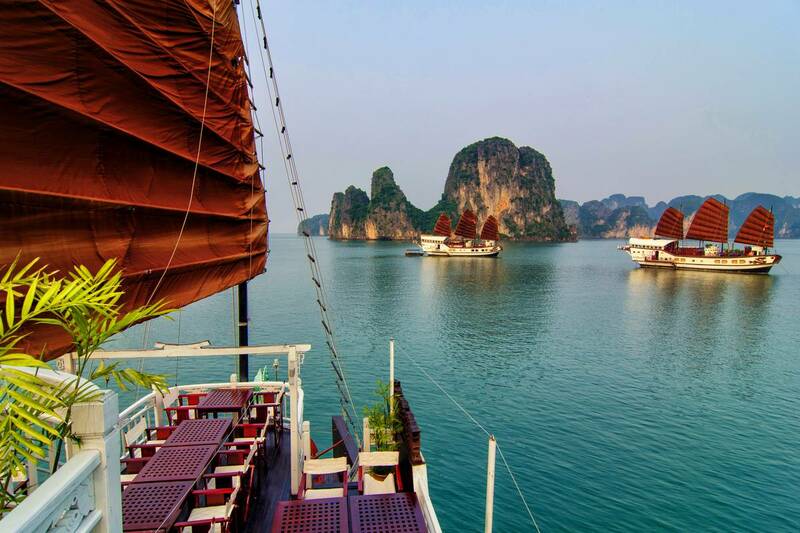 You also have 15 minutes for sightseeing over Halong bay. Hai Au Aviation is the unique seaplane service in Vietnam until now. 3.5 – 4 hour is the certain time for transfer from Hanoi to Halong Bay by car for 170km distance. Because of road conditions and speed limitation that this bus trip will be slow and time-consuming. You will be picking up at your hotel in Hanoi Old Quarter. Indochina Junk does pick up our visitors at their hotel in Hanoi Old Quarter. Other places far from Old Quarter, please contact us for details. Other tour operators might not pick up at your hotel, they will ask you to be at certain place or their office… for pick up, and so you should check it in advance. It takes 3.5 hours from Airport to Halong Bay. Because there is not shuttle bus service with pick up at Airport so you have to hire a private car for this service. Please, note the standard check-in time for Halong Bay cruise is 12:00, you should arrange your flight time to fit this schedule. You can travel from Halong Bay to Cat Ba Island by taking wooden junk from Bai Chay habor to Gia Luan habor, from there you get the shuttle bus to Cat Ba town. Another option is taking ferry from TuanChau Island to Gia Luan habor then Cat Ba town. You can travel from Halong Bay to Ninh Binh city. Ninh Binh is also a great place to visit. After Halong Bay trip, you can get local bus to Ninh Binh at Bai Chay bus station (not far from habor). There is also private car available for this transfer service. The distance is 220 km and takes more than 4 hour driving. Normally, travelers drive from Halong bay to Hanoi for stop then take an overnight train or bus to Sapa but you can also travel from Halong Bay to Sapa on an overnight bus (Phuc Xuyen bus). They have daily schedule at 6:45, 11:00 and 18:00, departing from Bai Chay bus station to Sapa. However, it is a long distance, nearly 500km. Transfer from Hanoi to Halong Bay passing by Bac Ninh, Hai Duong and Quang Ninh province, you will get to see country side with many villages, water buffalo, rice fields… and other interesting local life feature, so be ready with your camera for this 4 hour driving. Yen Duc village locates 70km from Halong Bay, on the way back to Hanoi. It is about 2 km from the main road to the village. Indochina Junk has developed this community-based tour to promote local culture and bring the unique experience to visitors. You can choose to stop by there for 2-hour, 5.5-hour option or stay overnight in the village to discover. The boat was really nice and I was very Happy we did not see so many boats on the tour. It felt that we were alone on Halong Bay. The staff was fantastic very relaxed and did everything they could to make the trip amazing!